Andreas Elias Büchner was a German doctor, born in Erfurt in 1701 and who died in Halle in 1769. He was educated at the protestant school, then went on to study at the universities of Erfurt, Halle and Leipzig. 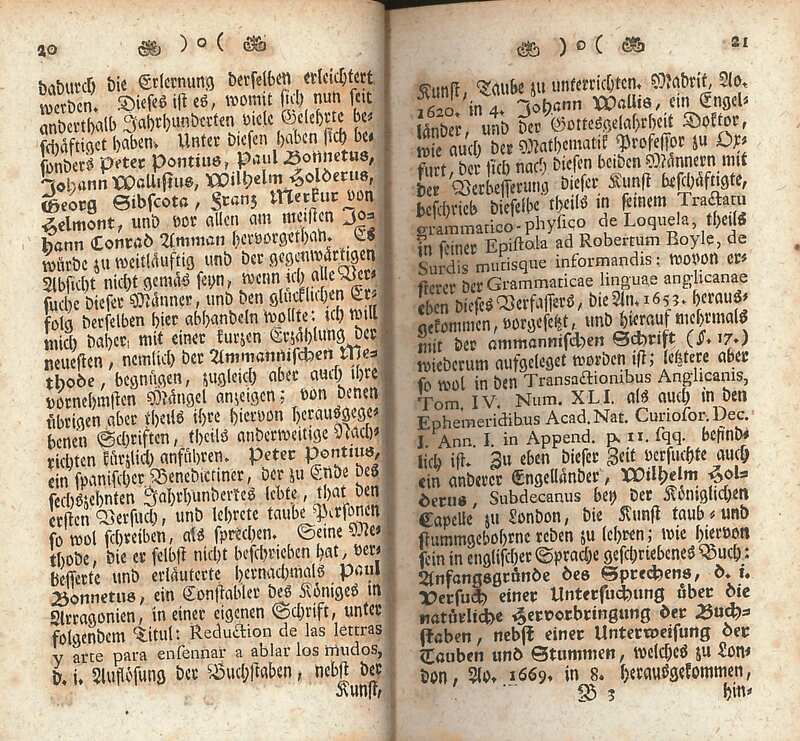 He became a member of the Prussian Academy of Science in 1738, and a professor at Halle University in 1744. 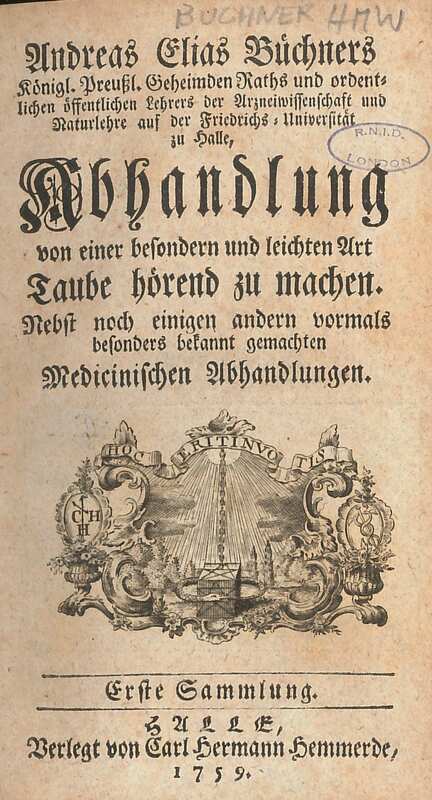 He was a follower of the Halle doctor and chemist, Friedrich Hoffmann. He discusses Sebastian Truchel’s ‘acoustic drum’ that he had demonstrated to the Royal Academy of Science in Paris in 1718 -“A person hard of hearing in both ears, may, by means of a semicircle of brass or silver, which goes round the hinder part of the head, under the hair or peruke, fasten two such drums to his ears” (p. 24-5). He talks of other methods of ‘hearing’ vibration – “Conrad Victor Scheider, so celebrated for his description of the mucose glands of the nose, in his book, De ossibus temporum, published at Wittemburg in 1653, in 8vo, p. 43, relates the same thing of some peasants, who sticking their staves in the earth, held one end in their teeth” (p. 28). Further on he says, “the deaf person may hear very well, on holding, by the lower rim, a beer-glass, to the upper teeth” (p.42). His method of getting someone to ‘hear’ seems to have involved feeling vibrarions via some material – essentially using bone conduction. The German original is much longer than the English version, so there may well be much more to it. Büchner asked him for a specimen of particular butterfly that featured in the 10th edition of Systemma Naturae. 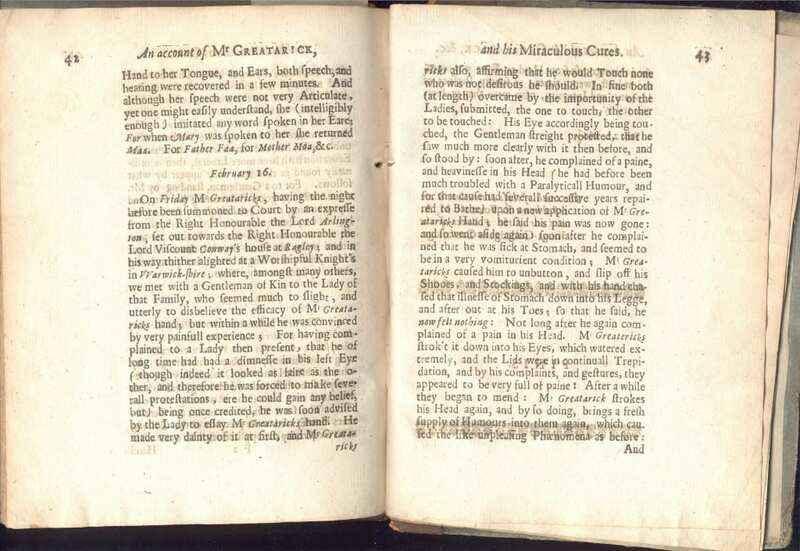 On this page he discusses the history of deaf education, covering Peter Pontius, Paul Bonnet, John Wallis, and so on. I found very little on Andreas Elias Büchner on a brief search. Perhaps he is a forgotten figure in the history of science, or perhaps he is only marginal. If you have had an opportunity to read the original book in full, please make a comment. 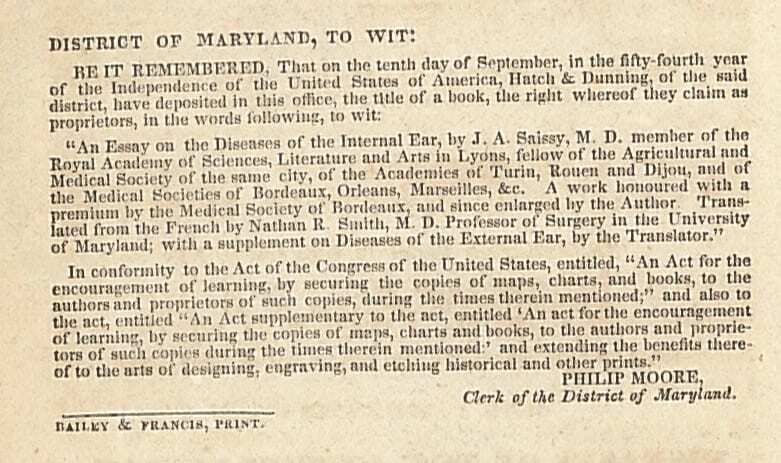 An easy and very practicable method to enable deaf persons to hear: together with a brief account of, and some reflections and observations upon, the several attempts formerly made for the benefit of such persons. London, MDCCLXX. . 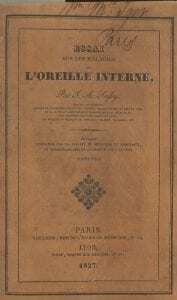 Available from Eighteenth Century Texts, online. Zelle, Carsten, Experiment, Observation, Self-observation. 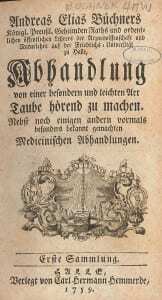 Empiricism and the ‘Reasonable Physicians’ of the Early Enlightenment. Zelle / Early Science and Medicine 18 (2013) 453-470. “Mr. Greaterick stroked him again, rubbed his Body all over with Spittle” – An account of Mr. Greaterick and his Miraculous Cures. Lincolnshire born Henry Stubbe or Stubbes (1632-76) grew up in Ireland after his ‘anabaptistically inclined’ father was expelled from his living as Rector of Partney. His mother took him to London in 1641 after the rising, and he attended Westminster School where he excelled at languages. The OED entry says “Stubbe’s sharp tongue and conceit often caused him to be ‘kick’d and beaten’ by his fellow students and, on one occasion at least, publicly whipped in the college’s refectory ” (ODNB). After his BA and then serving in the Parliamentary army for two years, Stubbes returned to Oxford and was was appointed deputy keeper of the Bodleian Library (ibid). Around this time he became friends with various luminaries of the time including Thomas Hobbes and Thomas Willis, a founder member of the Royal Society. After studying medicine and writing The Indian Nectar, or, A Discourse Concerning Chocolata (1662), he eventually settled in Warwickshire. It was there that he came across Valentine Greaterick or Greatrakes and wrote a book about him. 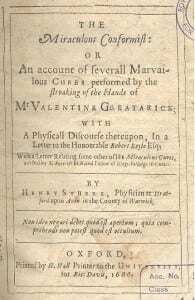 The Miraculous Conformist, or An account or severall Marvailous Cures performed by the stroaking of the Hands of Mr. Valentine Greaterick, with a Physicall Discourse thereupon, in a Letter to the Honourable Robert Boyle Esq. (1666). Greaterick was a ‘stroker’, using his hands to rub the body of the patient and effect a ‘cure’ by rubbing the sickness out, perhaps through the toes. Stubbes was at pains to say that any cures were through God and not the devil, and that Greaterick prayed – “I observed that he used no manner of Charmes, or unlawful words; sometimes he Ejaculated a short prayer before he cured any, and always after he had done he bad them give God the Praise.” (p.8). People noticed that he smelt fragrant, and “Dean Rust observed his Urine to smell like Violets, though he had eat nothing that might give it that scent.” (p.11). 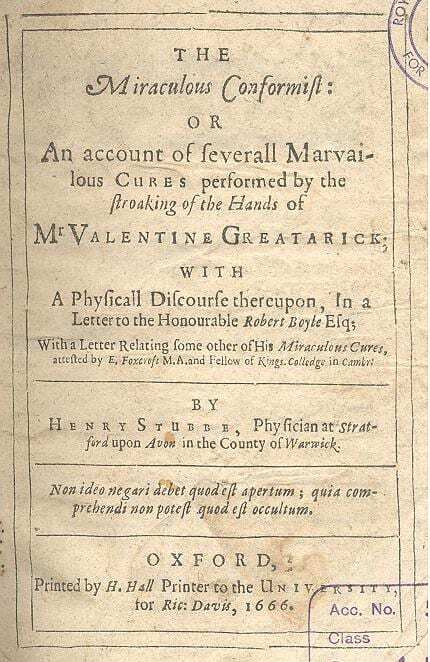 the notion I have concerning Mr. Greatericks is the most facile, for I imagine no more to be in him, than a particular Temperament, or implanted Ferment, which upon his touching and stroking shall so farre invigorate the blood, spirits, and innate temperament of the part (Nature being only oppressed) that they performe their usuall duties: This being done, it is Nature Cures the Diseases and distempers and infirmities, it is Nature makes them fly up and down the Body so as they do: they avoyd not his Hand, but his Touch and stroke so invigorateth the parts that they reject the Heterogenous Ferment, ’till it be outed the Body at some of those parts he is thought to stroke it out at. It is easy to laugh now but these were days before modern medicine when any attention for a desperate person from someone who might effect a treatment would be welcome. However I cannot resist a few more examples. Greaterick is supposed to have cured, in the presence of Lord Conway, a boy of fourteen of leprosy. Mr. Greaterick stroked him again, rubbed his Body all over with Spittle. My Lord ordered the Boy to return, if he were not Cured: but he came no more (p.28). We are not told whose saliva, but anyway the dice are loaded – he should have had the boy return if cured. A woman of Worcester having a paine driven into those parts which modesty would not permit her to let Mr. Greaterick stroke: she went away as if she had been cured, but is since sick of an intolerable pain there. Such consequences are usuall, when the Disease is not stroked out (p.29). Stubbe later fell out with the nascent Royal Society – “Not only did Stubbe believe that the protagonists’ claims regarding the utility of science were vastly exaggerated, but he was convinced that their inflammatory rhetoric seriously threatened the humanist culture of the universities, the erudite foundations upon which protestantism rested, as well as the medical profession.” (ODNB) Stubbes, who clearly had a talent for controversy, drowned in a shallow River near Bath, as his friend Anthony Wood wrote, “‘his head being then intoxicated with bibbing, but more with talking, and snuffing of powder’” (quoted in ODNB). Below, Greaterick stokes Lord Arlington – click for a larger image. Treponema pallidum is the bacterium that causes syphilis. Until 1905 there was no effective treatment. It is not always sexually transmitted and can be congenital as seems to be the case in the paragraph below. It can cause deafness, but whether the deafness in this example was a result of syphilis or from some other cause we cannot of course say. Here I may tell […]about the saddest case I have ever come across, and I am now looking back over something like fifty years and more, – there was, in the Bow and Bromley Workhouse Infirmary a poor deaf and dumb woman, her husband was the same and they had deaf and dumb children – so far the case was distressing enough – – (we will not disclose the name. It would be unkind to the children who are now living). Then this poor creature began to develop syphilitic symptoms in the wrists and ankles, and one by one her arms and legs had to be amputated. I remember that at the last she was reduced to catching a piece of slate pencil which dangled from above, between her teeth and then writing with it upon a slate – the slate of course had been fixed at a convenient angle. We however could be understood by her easily enough through the sign language which she could see us using. Her faith held out to the end. The sins of her parents had indeed been visited upon her. She was mercifully taken not long after. R.I.P. Quite an appreciable proportion of deaf people owe their affliction to the disease indicated. We veil it under the name of Hutchinsonian symptoms. If the reader wishes to pursue the subject further he should read Dr. Kerr Love’s Lectures on Deaf Mutism procurable from the National Institute for the Deaf. I have come across some who refused to believe that this disease is ever inherited among the deaf. A member of the committee of a school for the deaf in the north of England denied it with his heart, while the head master of the school quietly pointed out to me a score of such cases. The ‘Hutchinsonian symptoms’ are named after Sir Jonathan Hutchinson. 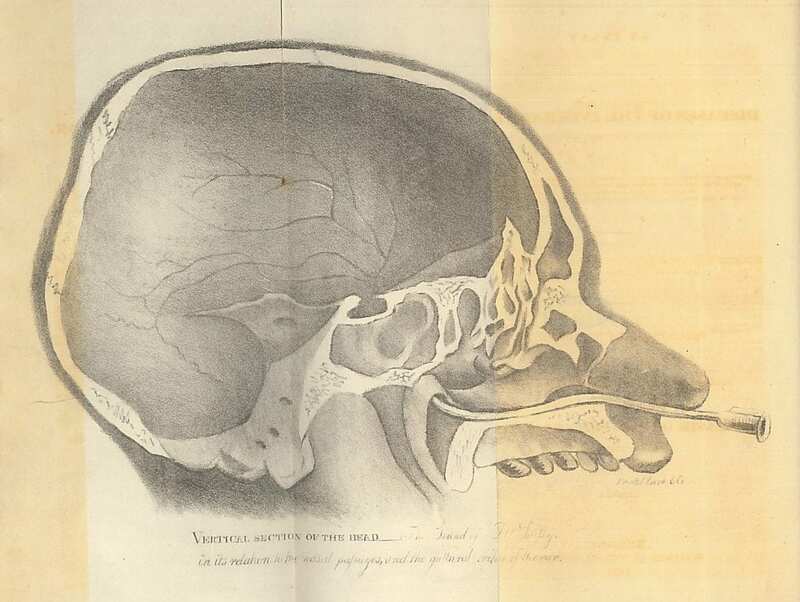 He “was the first to describe his triad of medical signs for congenital syphilis: notched incisor teeth, labyrinthine deafness and interstitial keratitis” (Wikipedia). The discovery of penicillin greatly reduced the disease in the 1940s but the last decade has seen it begin to increase again. There is increasing concern in medical circles about the overuse of antibiotics which are our only effective tools against many diseases that are now becoming resistant through their wasteful or pointless overuse. Of course we are talking about “the poorer classes of the community” here (ibid). He adds later, “In the wealthier ranks the symptoms are often much lkess marked” (p.462)!